Break before the corner, not at it. Cycle slower on a wet road due to the diminished Coefficient of friction both between your tyres and the wet road but also the break pads and wheel rims because as explained below the laws of physics dictate that you will enjoy less grip/adhesion/traction on a wet road. Look ahead as far through the corner as possible. To turn a bicycle, you must lean inward toward the direction of the turn. The faster you are going, and the sharper the corner, the more you must lean as decreed by the laws of physics. You have no choice about this, for a given speed and turn radius, the centre of gravity of the bike/rider must be moved sideways a particular amount or the bicycle will continue ahead more than you need it to, whereupon you will spin away from the corner which is not a nice feeling and needs to be avoided at all cost. The closer your centre of gravity is to terra firma the better, so drop your hands down into the 'handle bar drops' (if riding a road bike) and try and get your chest down close to the top bar. It is your choice whether you lean your bicycle more than, less than, or the same amount that you lean your body, to get your centre of gravity. But the sensible method is shown in the LH sketch below. Leaning the inside knee into the corner (similar to a motor bike racer), while keeping the bicycle more upright, is popular, particular amongst new cyclists who are concerned not to strike the inside pedal on the road. This enables the bike to remain 'more upright' and therefore less likely to skid out from under you, particularly on a wet road. Some cyclists believe that sticking out their knee or leaning their body into the corner (away from the bike) improves cornering which may be reassuring. Care that on uneven roads, it can work against you, as any body weight that is not centred over the bicycle puts a side load on the bicycle. It may also restrict dropping your body weight further back on the seat. The more experience at cornering, the better you become in fine tuning these variables. Some very experienced cyclists prefer to lean the upper body and the bicycle equally. Keeping body and bicycle on the same angle has the advantage of keeping the steering axis, tyres and centre of gravity in the same plane. But not recommended for rookies, particularly on a wet road whereupon diminished Coefficient of friction. (ii) other peddle - the outside pedal - is at 6 o'clock (ie. your foot is down low). Pushing down on the outside pedal which is at 6 o'clock will assist your bike hold the corner. By positioning the outside foot at 6 o'clock and the inside foot at 12 o'clock and leaning the inside knee in twds the corner the cyclist is able to hold the bicycle more vertical which is a comforting feeling. Body weight is low, thereby closer to the centre of gravity. Outside foot is at 6 'o'clock and pressing on the outside pedal which increases torque on the outside of each tyre, particularly the rear tyre. Inside foot is at 12 o'clock. 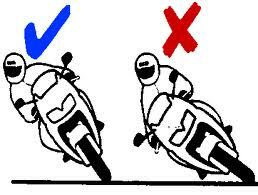 Inside knee is leaning into the corner which enables the rider to keep the bike more vertical to counter balance. Back is bent down for lower centre of gravity. Hands are not tense.